z man’s birthday party break down. z man’s birthday party a few weeks ago was a success!! i was able to pull together a lunch consisting of one 5 foot turkey sandwich, strawberry spinach salad with poppy seed dressing, jones soda, cupcakes, chips, madeleine cookies, cake, etc..
it was a lot of work, but fun! we gave lollipops to the kiddos as a favor and little packages of madeleine cookies for the adults. *lemon curd center. this was awesome. i could eat that stuff alone. i found the lemon curd recipe here and she found it here. *for white piped frosting + cupcakes i used a marshmellow buttercrem. click here. good, but can melt easily. * madeleine cookie recipe here. i had to look one up last minute as my mom was out of town and she has a great recipe she made growing up. so, next time i’ll definately use hers. the ones i made were good, but not quite sweet enough. * strawberry spinach salad. i’ll have to share that recipe another time when i can get a pic. this maybe my favorite salad and i’m seriously thinking about to go all grandma on you and keep it to the grave. but, i’ll have to share sometime as it was shared with me. 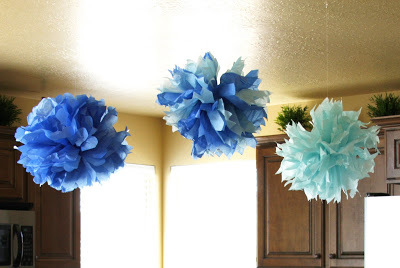 oh, and i also made some cute tissue pom poms to hang from the ceiling from directions i found from martha stewart. get them here. oh, and see my little cakes stands? remember when i made them here? try it, it’s fun. you do things with so much flare and class. I’m going to have to try those cake stands. love it all!! You know how to throw a party. We only use the sprinkles buttercream frosting…it’s the best frosting and I make myself sick eating it while frosting :). Love the lollie’s and the cakes. Have I told you how much I love that you have a boy just older than mine. 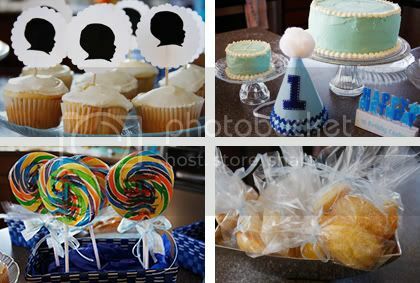 I can’t wait to copy this exact party… just kidding but oh so cute! I love your blog. You are sooo creative. I’m glad I found you. I have a z man too and he turned 1 on April 17th. I also call him pickle. This party looks so cute! Love the little party hat!